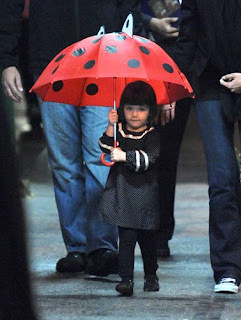 Baby Suri is probably the most stylish baby in the world! Not to mention that she has those very cute/angelic/pretty face too (thanks to Tom and Katie). I can't wait til she grows up and become a real diva herself. She always looked cute in everything she wears, thanks to her mom Katie Holmes Cruise who has a good style herself. Although I'm not really a fan of Katie's style (because sometimes she dresses really good but other times she dresses in styles that are not really my idea of good-lookin') but I do love Suri's style. The only accessory she needs is a bottle of milk. Look at those very nice Coat! Can' get no prettier than this one ! I Love Love Love this red floral dress! one with a simple denim dress and the other is in a cute stripey dress. She's one cute future star ! Be sure to stop by my blog as I am having a contest today! I adore this little lady! I added you on both of my Lists. She is sooo adorable! What a little fashionista, she's going to be gorgeous when she grows up. i love suri to pieces. perfect match for my baby boy.